superdumb supervillain: Red Robin Kids' Cookoff - Vote Donovan! Red Robin Kids' Cookoff - Vote Donovan! This time next week, I'll be in Denver watching ten aspiring burgermakers compete in the Red Robin Kids' Cookoff. One of the contestants, twelve year old Donovan, is from Wichita and I was invited to be a correspondent at the event to cheer him on. I am pleased to say that Donovan is currently the leader in the online voting with his Mt Vesuvius Burger, a sweet and spicy concoction featuring his homemade Lava Sauce, plus crumbled blue cheese and bacon. Mmm, bacon. We had the pleasure of meeting Donovan's family and having dinner with them at our local Red Robin, on the Waterfront in NE Wichita the other night. He is a really cool kid! Donovan likes math and science best in school, although he's also very good at geography– hence the "Mt. Vesuvius" reference. He plays viola with the Wichita Youth Symphony and composes music. He's also a lot of fun to be around. I wanted Roo to interview him but she was pretending to be shy. Jasper, not so much. Several locals have already asked for Donovan's burger, so hopefully it will be added to the regular menu! Be sure to vote for Donovan every day. 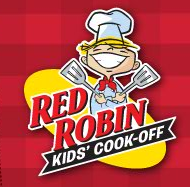 The whole Red Robin Kids' Cookoff will be broadcast live online on Thursday, December 9th at 10am MST. If you'd like to tune in, sign up for the webcast. Disclosure: My travel and lodging are being provided by Red Robin in exchange for my services as an event correspondent. He's such a great kid, I can't wait to meet all the kids myself! I'm a sucker for provolone. We look forward to meeting you in Denver in just a few short days! Here's to Donovan and all of the Red Robin Kids' Cook-Off Finalists!